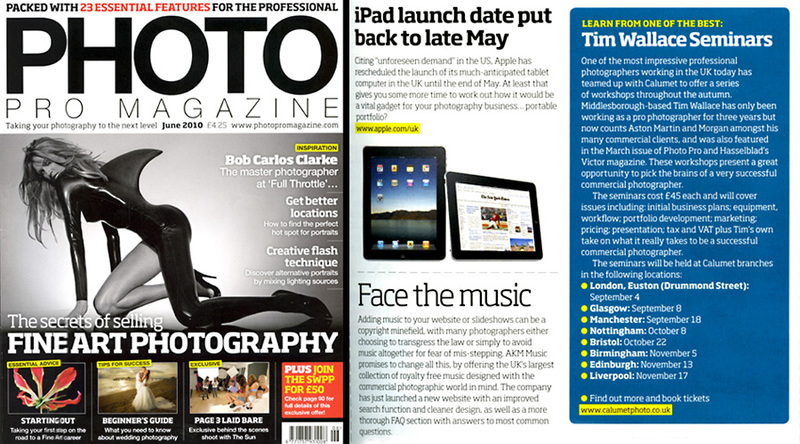 Photo PRO Magazine news pages have this month featured an article recommending this years 'Inspired' tour by UK based Commercial Photographer Tim Wallace. The tour begins on Sept 4th in Central London and continues through across the country until November 17th. Tickets are in demand and some venues have only limited places remaining so if you would like to attend please ensure that you reserve your place soon. If you wish to book a place on any of the events mentioned on this page please contact the marketing department of Calumet UK who organise our placements on these seminars or visit the dedicated Calumet Events pages. You get further information regarding all our Seminars here.